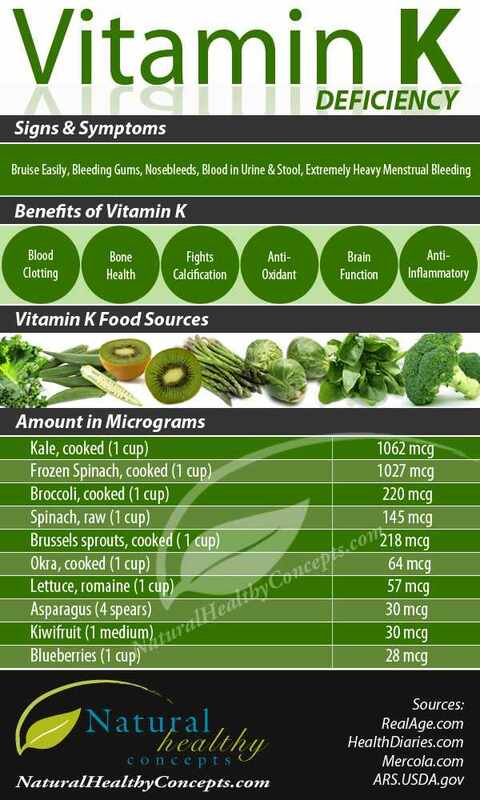 Vitamin K is an essential nutrient for healthy blood and bones in your body. This infographic shows you the foods containing Vitamin K as well as how much you typically get from a normal serving. You'll notice almost all of them are green vegetables - but you'll also find kiwi and blueberries on the list. If you are deficient in Vitamin K, you could suffer from things like bleeding gums and nosebleeds as well as easy bruising and other symptoms. The right supplement might be a smart way to reverse a Vitamin K deficiency.